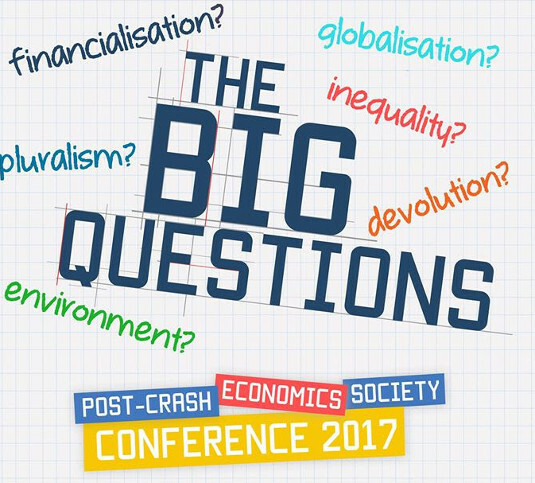 I attended the third Post-Crash Economics Society Conference 2017, held at University Place, Manchester on the weekend of 18-19 March 2017. Most of the conference was split into three parallel streams – themed as financialisation, inequality and devolution. A civil discussion – this talk by Bob Kerslake looked at UK devolution. Bob said that devolution was currently popular (79% in favour) and that 40% of UK output is generated by London and the south east. His conclusions included that the current devolution focuses too much on the cities and mayors, that currently some areas are off limits (eg education), and that local funding can only be raised through business rates and council tax. He said that voting reform needs to be introduced to reflect the electorate, some form of proportional representation such as in Scotland, because of the change from the 1950s two party system to today’s multi party politics. He said his view is that devolution needs to be based in splitting up England into large regional areas, eg south east, south west, midlands and north. Brexit means..? this panel session involved Phil Whyman, Grace Blakeley, Vicky Pryce and Francis Cappola. Phil, speaking as someone who voted to leave the EU (the only one at conference? ), looked at statistics produced to estimate the costs and benefits of leaving the EU – he noted that only one study was from a Post-Keynesian viewpoint. Grace Blakeley, from IPPR North, looked at the position of the north west: the effects of the Thatcher administration in the 1980s, that north west growth lags behind where it should be, that London is well ahead of the rest of the UK on multiple measures, that the region worked more strongly than other areas to leave the EU despite the effects of leaving are likely to be negative, and that no activity had currently replaced the old industrial base. Vicky Pryce looked at economics connected with leaving the EU: £60bn has already been spent supporting the pound compared to the £80bn cost per year of the UK being a EU member, there is likely to be not much growth in the foreseeable future, that purchases had already moved to the basics, that wage growth is slowing down, and there is likely to be further a inbalance in the economy with a slowdown in investment. There followed a lively question and answer session. Powerhouse or pipe dream? The future of the north – a panel session involving Neil McInroy, Ed Cox and Sean Anstee. Neil said the concept of the powerhouse was being applied internationally – typically involved some sort of fund being awarded to an area (normally a city), it is usually not new money, and it is normally applied without any connected industrial policy; he said such plans and frameworks needs to sit on top of an industrial policy and there is a great danger the northern powerhouse, like its predecessors, could fail. Ed Cox, Head of IPPR North, said there is a danger the powerhouse could cause problems unintentionally, but the powerhouse could work but won’t in the context of the current government because George Osborne had structured all the current devolution plans around big cities, fast trains and powerful mayors; he said the plans could be improved in a number of ways – improving human potential (eg education), braking down barriers (eg research and development), improving infrastructure (eg transport and broadband), finance, and carrying this all against a back round of stable policy and infrastructure; he said London is decoupling from the rest of the country and the only chance of changing the situation was the introduction of regional devolution, eg the north. Sean Anstee, from Trafford Council, said that cities such as Manchester and Leeds, where too small compared to other cities internationally, that previous attempts at devolution had been derailed by central government, that the EU referendum was an expression of the electorate wishing for a redistribution of power once the UK has left the EU and in response the government needs to explore ways to support local communities. There followed a wide ranging question and answer section of the session. The production of money – this keynote address, given by Ann Pettifor, brought everyone together in one lecture theatre. Starting from her latest book, The Production of Money, Ann said an understanding of money production was fundamental to understanding economics. She said that money was created from thin air by individuals and companies applying for credit from banks ie the monetary system. Before 1690 and the formation of the Bank of England, the only option in the UK to get credit was from the local robber barrens, or other rich person, who would charge interest on any loan. John Law, the Scottish economist, tried to introduce the monetary system without success, but in France, in 1716, introduced the first central bank in the world and ended virtually being the French prime minister! She said the use of a credit card, which requires no other documentation, only relies on a promise from the individual concerned to the shop, via the bank that issued the card, that the money will be repaid, and this must be backed up by the law. There followed how the value of money is set (by a central bank) and how the lack of a legal system that does not backup credit means there is no credit. There followed a lively question and answer session. Contending economic theories: a pluralist view – this lecture was given by Andy Ross and Fred Day. Andy started his talk building a simplified block diagram of economy, centred on expenses, assets and activity. He said it was crucial to apply all the pluralistic tools when carrying out economic examination of issues. Fred Day talked about the joy of pluralism. He said some apply mathematics to economics, but it is really all about a narrative, and that it’s important to know the history of economics to avoid repeating historical errors. There once again followed a detailed (and pluralistic!) question and answer session. I mentioned to a number of people, including some of the event organisers, that PCES should organise a one day unconference – I’m sure, given the nature of the questions from the attendees, this would work. I’m also prepared, given my previous experience, to become involved in the organisation of such an event. The weekend concluded with a number of drinks being consumed at the nearby Kro Bar in Oxford Road. Many thanks to the organisers and sponsors for running a fantastic conference.